Just Jingle: Easter Blessings - Stampendous! Shaped Cards Challenge! Easter Blessings - Stampendous! Shaped Cards Challenge! Have you checked out the new challenge with the Stampendous team this month? Each Saturday in March, we'll be challenging ourselves (and you!) to make a shaped card or project - something other than the traditional square or rectangular card. Doesn't that sound like fun? Here is the card that I created for this week! I used Sally the Cricut to cut the shape and the overlay and then stamped in the background and paper pieced the eggs into the nest. I used the fabulous Nest Egg Perfectly Clear Stamp Set! I LOVE this gorgeous stamp set! Perfect for spring! And the sentiment is a fun one from SRM Press. The ribbon is May Arts yumminess! 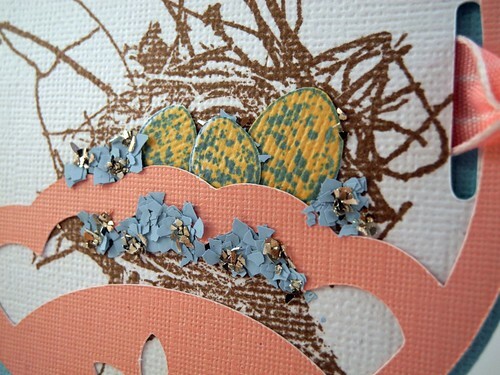 I accented the nest and eggs with the Powder Blue Colored Fragments and some wonderful silver Glass Glitter. What a unique and beautiful card! Sweet Easter Egg! Lovely little nest tucked inside! Such a cute shape to work with and I like the cut out section. This card is sooooo awesome and I love me some SRM...lol!!! I LOVE this shaped card! super cute and love the egg shape~so different!!! That is adorable, what a great card! Darling super card, Jennifer. I love the little bed of fragments for the eggs. awesome card...great shapeI like that sticker you used for the sentiment...perfect. 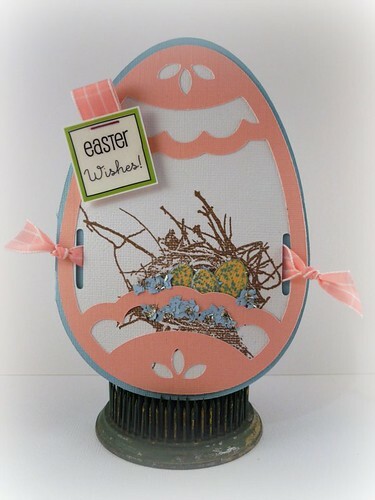 Awesome card- love the egg shape and the perfect image- love the tiny nesting eggs! Great card, the glitter looks like shattered egg shells. This is beautiful Jingle!! Great job with the shaped cards!